Energy Club NT - Onshore Gas Supply Chain - What will it look like? 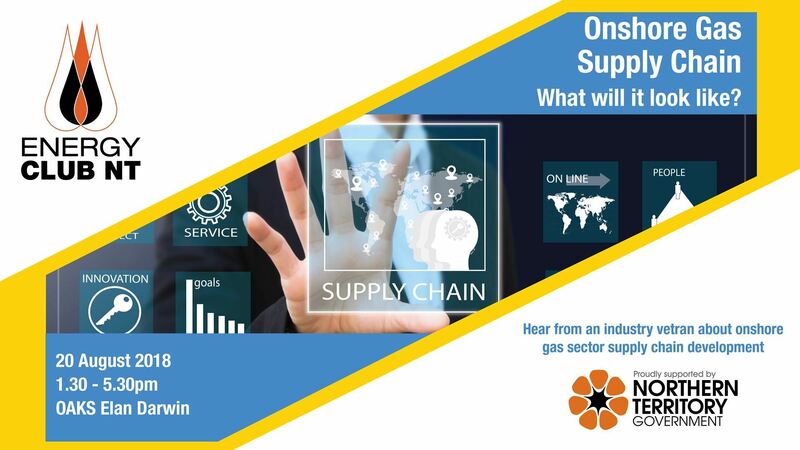 Onshore Gas Supply Chain - What will it look like? The onshore gas sector is somewhat new to many SME’s across the Territory and understanding the supply chain, phases through exploration, appraisal and development are crucial. Looking at potential procurement and buying behaviours of Operators and their major contractors will help businesses start to consider how and where their capability might fit in to the supply chain and what their businesses can do now to ensure they are well placed to take advantage of these new opportunities. Energy Club NT will will be hosting a half day information session to educate Northern Territory SME’s and assist local businesses to best position themselves for ongoing opportunities in the oil and gas sector. With a positive decision to proceed with the development of the onshore gas industry, it is important that the industry, government and supporting businesses work together to ensure safe and responsible outcomes to benefit the Territory and also ensure businesses are benefiting from being given to opportunity to participate in service and supply of the projects as they develop.